The Good Doctor's Tonic comes courtesy of RedHeads Studios in Australia. 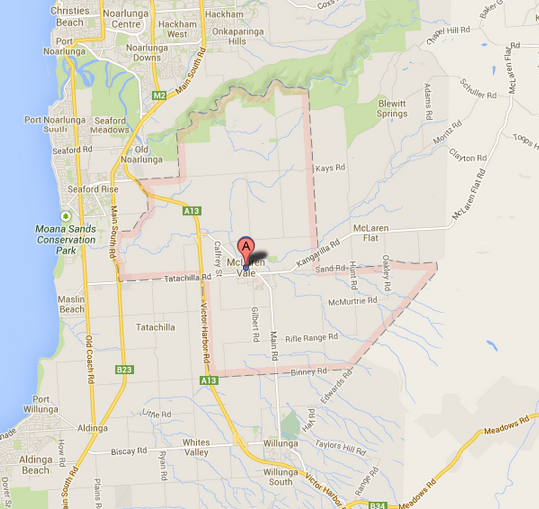 RedHeads Studio was set up in McLaren Vale in 2002 by Tony Laithwaite of Laithwaite's fame. The studio is comprised of young winemakers like Adam Hooper (La Curio), Andrew Pieri (Azzardo), growers like Nat McMurtrie (Pikkara) and the local GP Matt Brown who is responsible for the Good Doctor. 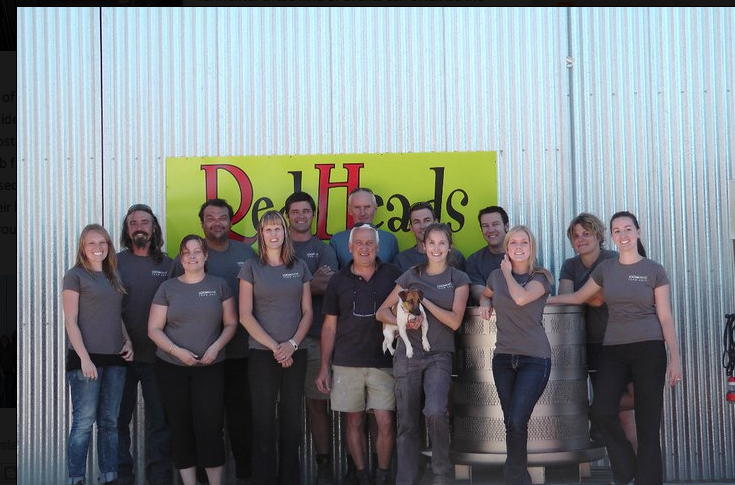 These wine obsessed folks, work for mainstream growers during their day jobs then come to RedHeads to experiment in their desire to make wines that are different to anything else on the market. 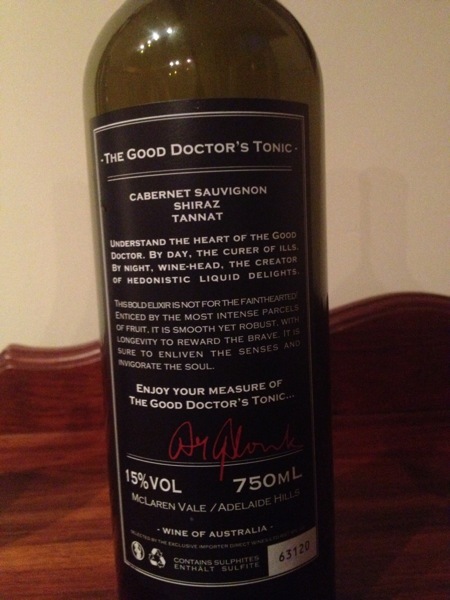 I love the quirky text on the back of the bottle, "Understand the heart of the Good Doctor. By day, the curer of ills. By night, wine-head. The creator of hedonistic liquid delight. This bold elixir is not for the faint hearted. Enticed by the most intense parcels of fruit. It is smooth yet robust, with longevity to reward the brave. It is sure to enliven the senses and invigorate the soul. Enjoy your measure of the Good Doctor's tonic." 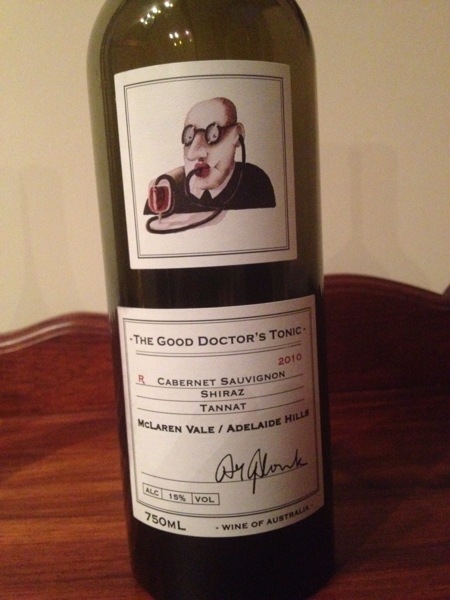 The Good Doctor, Dr Brown, has delivered indeed in producing a special red wine. its an unusual blend that it includes Tannat, best known for being grown in South West France and Uruguay. Tannat produces very tannic wines and in warm climates produces good fruit flavors while still retaining lots of natural acid, a good counterbalance to cabernet sauvignon and shiraz. As the description on the bottle points out, is it long lived with layer after layer of fruity flavours. Black berry on top but with something unusual underneath, almost savoury/bitter. Another great red from Australia and RedHeads which unfortunately now is difficult to get hold of.